1. Recommend allowing a better way to Custom Sort my movie collection. For example, I want all my 23 James Bond movies to be together and in the order of Production Date. The only way I can do this is to set the "Sort Order" to "Collection Number", assign all my movies custom collection numbers so I can have all my James Bond movies together. The problem is, is I have to assign my entire movie collection custom numbers so I can have them also in the order I want. Additionally, in order to leave space for future movies that I add, I have to space my Collection Numbers 10 apart, i.e., 10, 20 30, etc... to leave 9 empty numbers open between movies to add titles as my collection grows. This is the only work around that I could find to view my movies in the order they are in my bookcase. By the way, FANTASTIC software overall, looks super on my iPad Air 2!! It sounds like you are only using the DVD Profiler mobile app. I only use the mobile app to view my collection. I don't use it to add/edit profiles, so I can't speak to that. That being said, if you have a Windows based computer I would highly recommend you unleash the real power of this product line and start using the DVD Profiler for PC software to work with your collection. 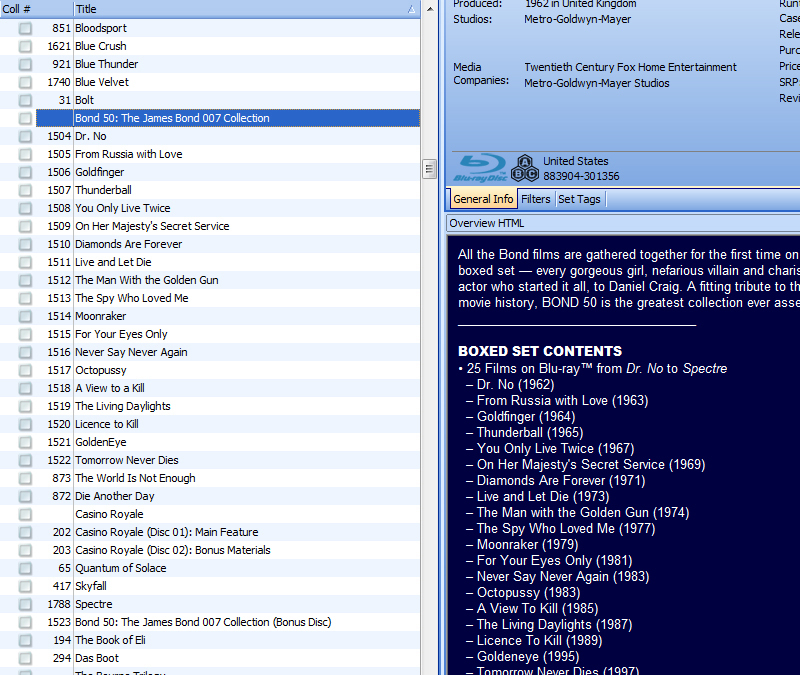 Example provided below from DVD Profiler per the Bond films that I own. The key item to focus on above is the "Sort Title" for the selected profile. Using the "Sort Title" field one can display their profiles alphabetically in any order they see fit, irrespective of the actual title names and Collection ID's assigned. In my case I never reorder my Collection ID's. When purchasing a new title I simply assign it the next available Collection ID. To keep my collection sorted alphabetically how I'd like I use the "Sort Title" field for each profile. In the case of the Bond 50 boxset shown above I decided going forward to keep all my Bond films (official or otherwise) grouped together. To accomplish this I went with the "Sort Title" naming convention, "Bond 50 <Production Year>: <Title>". This keeps things sorted quite nicely as you can see per the above. Know also though that the sort order is maintained whether the items are grouped within a boxset or not. See below, the "Collection View->Nest Box Sets" option deselected. Using the production year (or even release year in some cases) within the "Sort Title" field really does come in handy. I own a number of Battlestar Galactica titles on Blu-ray where limiting the sort title field to calling out the particular season numbering would not be enough. Adding the production year to the mix as well provides for displaying multiple boxsets and individual releases just as I'd like them. See below. The production year is also great to use within the "Sort Title" field for profiles in your collection which are named the same. Total Recall is a movie that comes to mind. I own both the original movie and the remake. Sort titles used shown below. In any event, I hope that my reply here was helpful, both to you and any others perhaps who might be new to DVD Profiler. Hopefully you do have a Windows based PC. The mobile apps are very nice, but DVD Profiler for PC is the way to go when it comes to working with your collection. And yes, the mobile apps can be updated to reflect precisely what you see within DVD Profiler for PC. I use a "DVD Profiler for PC" database with the mobile apps myself as I prefer the ability to update the mobile apps to match my local DVD Profiler database. To update the mobile apps the device in question needs to be on my local network. I then hit up the "Update Database" option, the mobile app in turn connecting to the DVD Profiler for PC application running on my laptop pulling down any changes, no Internet required. The other benefit to this approach is that I'm also able to enjoy my local cover art with the mobile apps where otherwise I'd be limited to the much smaller cover art offered by the online servers, manual titles not even having cover art.